In 1880 the 61st returned to India after an absence of more than twenty years. They were to remain in India for a tour of duty which lasted until 1893. The British Empire was at its height, and India was the jewel in the Empire’s crown. Rudyard Kipling, “The Young British Soldier”. “… we joined a draft for India in 1886 and joined the 2nd Battalion at Ahmednagar, where the cholera was very bad. We moved to Poona for Camp of Exercise in 1888 and then on to Deolali. That was my worst station, fever and ague with no injections in those days. In 1889 we proceeded to Bombay. Whilst there I was on two guards of honour. The first was for Prince Albert Victor, later Duke of Clarence, and the second for Lord Roberts. I also saw Captain Haig [later Field Marshal Earl Sir Douglas Haig], as he then was, play for the 4th Hussars at polo and won against the Bombay Gymkhana. “In 1890 I left Bombay to proceed with my company to Deesa. It was hot and healthy there though the shade temperatures went up to 118 degs. [48 degrees Celsius] in summer. We had punkas and the tatties [wetted mats] at doorways. It was a treat to get by the latter to get a breath of fresh cool air. “Then we marched back to Palumpur to wait another company from Ahmedabad and went on the B.B.C.I. [Bombay, Baroda, and Central India] Railway to Nusserabad in Rajputana. In 1892 we had two companies on detachment at Neemuch. We had it pretty rough there, losing a hundred men from cholera and enteric in the first year out of the Regiment of about 800 strong. Two of the lads came from Moreton and one from Campden, a namesake of mine. “I am pleased to say that I escaped it. There was only one man I know who pulled through from cholera. He was an old soldier named Bill Darke, whose home was Blockley. He was congratulated for luck and pluck and Captain Tufnell gave him a beautiful watch, a personal gift of great sentimental value, on his recovery. 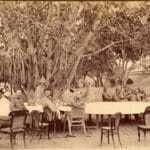 Picture: Officers enjoying tiffin under a banyan tree.